Vrindavan, 2017.02.20 (Vishakha Dasi for VT): Today is the disappearance day of Prabhupad Kishori-Kishorananda Goswami (Tinkadi Baba – also spelled Tinkudi Baba). Maharaj passed into the nitya lila in 1984, at the age of 77. Tinkadi Goswami was accepted by many in the devotional community as a siddha – a perfected or spiritually realized saint. Born in a family of acharyas in the Gaudiya Sampradaya, he was a householder guru in early life and later went to Braj to perform intense sadhana as a vairagi (renunciant). Most of the following brief biography is compiled from a book written by his disciple, Shri Binod Bihari Das Babaji Maharaj of Barsana. Prabhupad Kishori-Kishorananda Goswami (Tinkadi Baba) was born on magh purnima in 1907, in the village of Manoharpur in West Bengal. He was the eighth child of Shri Harimohan Goswami and Smt. Suradhuni Devi; six sons and a daughter had all died before he was born. In the birthing room, after the midwife cut his umbilical cord, a ritual was performed to protect the child from any subtle negative forces. The midwife placed the baby in her lap and declared, “This child is mine!” Then his mother ceremoniously purchased her son back for three cowries (tin kadi). Thus Tinkadi became his nickname. [This was done so that jealous or malefic spirits would be tricked into thinking he was only worth three cowries, and not of any consequence to them]. Kishori-Kishorananda Goswami was his real name, given to him by his father. When his mother Suradhuni Devi died young, Tinkadi Goswami was raised by his father and, to a great extent, his wet-nurse or daima. He was a naughty child who loved to play, and was not particularly interested in school. The fact is, he hated studying. As Binode Baba writes, “If he even heard the word ‘study’ it was as if the sky had broken and fallen on his head.” When the time came to go to school, he would disappear, and the daima would have to make a great effort to find him. But at the age of nine, his temperament shifted considerably after receiving upanayan sanskar (Brahmin initiation) and diksha (Vaishnav initiation) from his father. Thereafter, his mood suddenly became very profound. He began to study the Bhagavad Gita and other holy texts with great eagerness. Still, his official schooling did not go well, as he used his homework time to study the scriptures instead. When Tinkadi Goswami came of age, his father began to think of his son’s future. The family had a little land, but it wasn’t enough to support a family. So his father began to take him to the homes of his own disciples, thinking that in the future his son could also become a guru and support himself in that way. He instructed his son in the Bhagavata, the Chaitanya Charitamrit and so on, and soon he began to have disciples of his own. His marriage was then arranged to a young lady named Sheetla Sundari. During this period, he was very fashionable. He always wore dhotis and kurtas of the finest cotton. He never wore ordinary or soiled clothes. He also used to smoke, using a very beautiful hookah and along with it the finest tobacco from Vishnupur. Whilst travelling he would bring the hookah with him, along with a cook, and his disciples would carry him on a palanquin. Beneath the surface a great desire was growing in Tinkadi Goswami’s heart – the desire to perform intense bhajan (loving worship of Radha and Krishna). It was as if this desire was haunting him. Even though, for all intents and purposes, his lifestyle was to be engaged in seva, he was not satisfied. His mind always ran away to Vrindavan as if some invisible power was beckoning him with an uncontrollable pull. The feeling became so intense that one day he actually left for Vrindavan. In Vrindavan, after relishing the darshans in the ancient temples, he proceeded to Govardhan where he heard about a saint named Siddha Manohar Das Babaji. With great excitement he went to meet him, hoping to attain his blessings. However, when Siddha Baba saw him, he bowed flat before Tinkadi Goswami. He was completely unprepared for that and objected, but Siddha Baba said, ‘Why should I not bow before you? You are a descendant of one of the great Acharyas. You are a guru for all of us. If I do not offer my obeisance to you, to whom shall I offer it?” Still hoping for Siddha Baba’s grace, Prabhupad stayed on for some days. After spending a few days in many discussions about bhajan, he confided to Siddha Baba that he wished to take full shelter of Shri Vrindavan Dham and not return home anymore. But Siddha Baba sent him home, saying that the time was not right, but that one day his desire to live in Vrindavan would be fulfilled. When his son, Vrindavan Chandra Goswami, was only three months old, his wife died. He thought of marrying again so that his child could have a female guardian. But then his own daima agreed to help raise the baby. Tinkadi Goswami was only 28 years old at that time. Thereafter, Tinkadi Goswami went on pilgrimage to many holy places, from the Himalayas all the way to the Southern-most part of India. Still, he got no peace. He sometimes worried that he was not scholarly enough to perfectly answer his disciples’ questions. During this period of his vast pilgrimage, he received a blessing from a sadhu that all the meanings of the scriptures would be manifested within him. When he returned to Bengal, he started spreading the holy name all over through many towns and villages. Under great pressure from his friends to get married a second time, Tinkadi Goswami ran away to Vrindavan once again. He stayed with Siddha Baba, but after just a few days, he began to feel troubled by sexual desires. Siddha Baba knew everything, and instructed him to go back home. With no other choice, he stayed a few more days and then returned home. By Siddha Baba’s orders, Tinkadi Goswami got married again, to Saraswati Devi. At this time he was thirty-two or thirty-three. But he did not become engrossed in household affairs. Each morning he would rise at 1am for bhajan, and he traveled to the homes of many devotees to spread Harinaam. Wherever he stayed, he would make the devotees there perform 24-hour sankirtan. 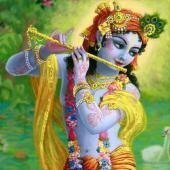 People were greatly attracted by his firmness in bhajan and his Harikatha, and they came to him in large numbers for initiation. At this time, he started wearing simpler clothes and gave away his hookah. Whenever he went to stay at someone’s house, he would build a thatched hut in an empty lot nearby and live in it doing bhajan. After arranging the marriages of his son and his first daughter, he took permission from his wife to leave home. With her full blessings, Tinkadi Goswami left for Vrindavan for the last time. Siddha Baba was amazed and said, “What is this, Gosai? Living beings bound by worldly existence are fulfilled by taking sheler of your feet. Such talk from your lips does not become you. Rise up. Calm down and rest without worry.” Then Siddha Baba gave him deep bhajan shiksha. He already had diksha from his father. Prabhupad then went to many great mahatmas of Vraj, but out of respect, no one would agree to give him vesh and thus become his guru. Finally, with no other recourse, he decided to take vesh himself. He took one of Siddha Baba’s kaupins and, making the Lord his witness, put it on. He also took up a staff and water pot, and made a solemn vow that for the rest of his life he would never touch money or see his wife’s face again. Taking permission from Siddha Baba, he then went to perform solitary bhajan in a secluded place. Tinkadi Baba loved the sparsely-populated forests of Vraj. He used to wander from place to place, dressed in a rough burlap loincloth and shawl. He never stayed at one place for a long time. However, he used to linger from time to time at Radhakund, for that was his favorite place of all. efforts, his mind was not yet completely steady and this gave him much sadness. But he continued his endeavours with full intensity. Once late at night, whilst Tinkadi Baba was seated on his asan, suddenly he saw a tall Vaishnav standing before him. He had a well-formed body, a shining golden complexion and beautiful tilak on his forehead. Prabhupad bowed down and asked who he was. He replied, “I am Vallabhacharya. I am pleased with your attachment to your bhajan. I will give you a mantra. If you repeat this mantra, your mental fluctuations will quickly end and your mind will become peaceful.” Speaking thus, he gave Baba a mantra and disappeared. Baba repeated that mantra, and in a short time he attained the result he had hoped for. His mind became completely merged in the thought of the Lord. On anther late night, again a divine Vaishnav appeared to Baba. He looked very similar to the previous one. His complexion was like shining gold and in his hands was a tulsi necklace (kanthi mala). Baba bowed to him and asked who he was. Baba became worried. He felt that if he accepted the necklace from Vitthalnath, the son of Vallabhacharya, he would be changing his Sampraday (from Gaudiya Sampraday to Pushti Marg). After this, Shri Vitthalnathji, with a pleased expression upon his lotus face, gave his blessing to Tinkadi Baba and disappeared. After that, Baba’s bhajan sharply increased in intensity. Through his absorption in bhajan, his bodily consciousness gradually dwindled. One day Tinkadi Baba felt his heart and whole body became illuminated with the light of pure consciousness. He opened his eyes and saw standing before him Sri Radha, the embodiment of the hladini shakti, radiating the light of a million moons, smiling in Her form as the bestower of great fearlessness. Just by seeing Her, it was as if every molecule of his body was drenched in a shower of invisible nectar of love. Even though he looked at Her without blinking, still he was not satisfied. He felt that if he had infinite eyes, that might help a little to relish the endless sweetness of Shri Priyaji’s beauty. Shri Priyaji said to Tinkadi Baba, “Your wish has been fulfilled. Still, even now there is much left for you to accomplish. At the proper time, you will meet Me again.’ Speaking thus, Sri Priyaji disappeared. Baba fell unconscious at Her disappearance. Thereafter, many more followers were drawn to take shelter of Tinkadi Baba’s lotus feet. He traveled to Nabadwip and Puri and showered his blessings upon the devotees there. After some time, he returned to Vraj where some of his renounced disciples began to live with him. Once, while Tinkadi Baba was residing in Giriraj talhati (the foot of Giriraj), a man came to him hoping to get a lucky number to use in gambling. Baba was observing a vow of silence at that time. “Baba! Baba!” the man shouted, and entered Baba’s hut without waiting for an answer. Baba raised his hand and showed him five fingers, indicating that he should come back in the afternoon after five o’clock. But the gambler thought he was telling him to use the number five. The fellow won a lot of money that way. When I arrived in India, at the holy place where Baba lived, I inquired about his whereabouts. The next morning I was guided to an ashram in the small town where Baba was staying at the time. [Baba was known to stay at one place for only one to three months at a time and then move to another place to perform bhajan]. I saw him just as I came in from the street, across a small field where he was standing. I could not believe my eyes – he looked like an ancient Rishi (seer) of a time centuries past. I was brought before him and introduced through a letter Jagadananda Das had written on my behalf. I cannot rightly describe him ­­– he was the very form of luminous, compassionate, divine love. I was accepted immediately by Baba with love, and by the group of sadhus who surrounded him. A typical day for us with Baba started with waking up at 3:30 am, (although he and one advanced Babaji, a very dear older guru brother named Vanamali Das Babaji, would rise by 2:00 am). After taking care of one’s bathroom needs and then bathing in a nearby holy river or kund, (water tank or pond) we would put holy markings (tilak) on twelve places on the upper parts of our bodies. Then we would all sit together for prayers and kirtan (singing and chanting the holy names of God) for two or three hours. This included the performance of an aarti ceremony (a ritual greeting the sacred images with offerings of lights, incense, flowers, and such). At sunrise we would finish the kirtan with the circumambulation of the holy temple, the holy basil plant (Tulsi Devi), and so forth. Each of us then went off to our own rooms or corners of the temple to do our two to eight hours of private meditation and worship practice (called bhajan-sadhan). Different functions have to be performed by the sadhus of any given temple or ashram. Some are cooks, one – the pujari – serves and worships the sacred images (Thakur), some buy groceries, and some wash the temple floors, etc. Everyone, including the head of the monastery (the abbot or mahanta), helped with the chores. At noon was the first meal, or honoring of sacred graced food (prasad): food that had been prepared following specific codes and observances, and then offered to the sacred images. After the offerings, all of us partook of the holy remnants, considering them compassionate blessings from our most holy and sweet, loving God. One of my main forms of service for Baba was to be alone with him from about 7:00 am to 11:30 am. I was to help him with anything he needed during that time. Since he hardly needed anything then, I often used that time while sitting with him for meditation. What I loved to do was remain very quiet and meditate with him, hoping no-one would come for his blessings and bring him out of samadhi (meditative trance). He was in samadhi most of the time. If he was given five or ten minutes of undisturbed quiet, he would enter into samadhi and soon he would start giggling and talking to someone in a voice so sweet only poetry can describe it. He entered into the sacred time and space of Radha and Krishna and interacted with them and the cowherd girls (gopis). This is the samadhi of the rasik pratitioner ­– participating in the activities of God and his beloved family and friends who are pure, loving beings. Among them are the realized rasik saints and siddhas! Then perhaps someone might come for his blessings and he would come out of his meditative trance for a while. But sure enough, within five or ten minutes of their leaving, he was back laughing and talking in transcendent sweetness! During an especially sacred month, the month of Damodar or Kartik (October-November) that comes each year, there are special observances (Niyam Seva) and increased practice for us to do. During this time of year we lived in a holy place called Radha Kund (the holy pond of Shri Radha). There Baba would host great saints like Sri Jeev Goswami and practitioner-scholars like Manindranath Guha. I remember one year in particular when Manindranath Babu gave path (a reading and elucidation of a sacred text). The text he read was Anand Vrindavan Champu. During the afternoon readings, Baba would walk up and down listening, sometimes with tears running down from his eyes during parts of the reading. At other times, he would laugh out and make joyous comments related to the text. It was indeed a special time! Baba always remained internally absorbed. He almost gave up eating altogether, and would only consume a small amount of food. He ate only what disciples would feed him with their own hands, and that too with his eyes closed. He had no knowledge of what he was eating. When a round on a mala is complete, the Sumeru or the central bead comes; then one knows the round is complete and can put the mala aside. With this kind of expectation, Prabhupad (Tinkadi Baba) was waiting for the Sumeru bead. But without a mala, where will the Sumeru bead come from? Then a bhakta said: ‘Baba! You have no mala in your hand.’ Prabhupad raised his empty hand and said, ‘Then this that I am doing japa on, what is it?’ Everyone laughed. Another servant said, ‘Baba! That is your mental mala.’ Prabhupad then became externally aware for a moment. What Prabhupad was doing during that period was the result of his previous practice. His awareness of the external world was practically non-existent. Gradually, Tinkadi Baba’s physical condition began to worsen. Eventually he became extremely weak and began to have difficulty breathing. One day a letter arrived from Vrindavan. It had been sent by Shri Kishori Das Babaji of Keshi Ghat Thor. Dear Baba, one night I had a dream in which a dark-skinned young boy said to me: ‘You sent Goswamiji home in the middle of a seven-day reading of the Bhagwat and you did not bring him back. Quickly arrange to bring him back to Vrindavan.’ I asked him: ‘Who are you?’ The boy replied, ‘I am Murari Mohan’. * After speaking thus, the boy disappeared. Baba, please come immediately to Vrindavan as soon as you read this letter. After hearing the contents of that letter, Tinkadi Baba never spoke with anyone again. He did not even open his eyes again. Two days passed, and on the afternoon of the third day, Baba developed a fever and his body began to shiver. His pulse, too, became weaker. Just before daybreak of the fourth day, Baba’s heartbeat gradually began to weaken. Receiving the news that Tinkadi Baba’s condition was critical, Prabhupad Sri Jeev Goswami of Srivas Angan came to see him. It was then about seven in the morning. One servant began to chant the Holy Name out loud at Baba’s lotus feet. Sri Jeev Goswami embraced Baba and began to cry saying, ‘Jai Nitai! Jai Nitai!’ Other devotees started to perform sankirtan of the Holy Names in the audience hall of the temple. By then it was 8:30 am. Baba’s lips suddenly began to quiver. Then, uttering ‘Jai Nityananda Ram! Jai Nityananda Ram!’ in a barely audible voice, he gave up his physical form and entered nitya lila. In a short while, the news of Tinkadi Baba’s disappearance spread everywhere. Innumerable people came weeping from all directions to have a glimpse of him for the last time.